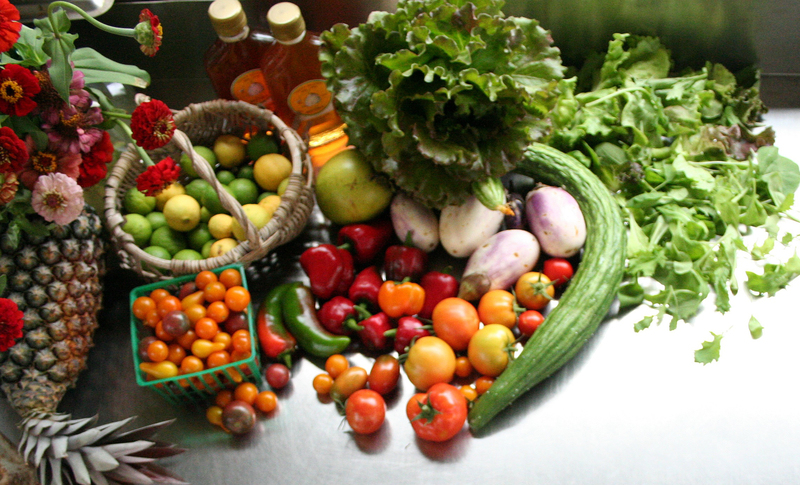 In the high season (January through April) we have an incredible variety of offerings at our farmstand. 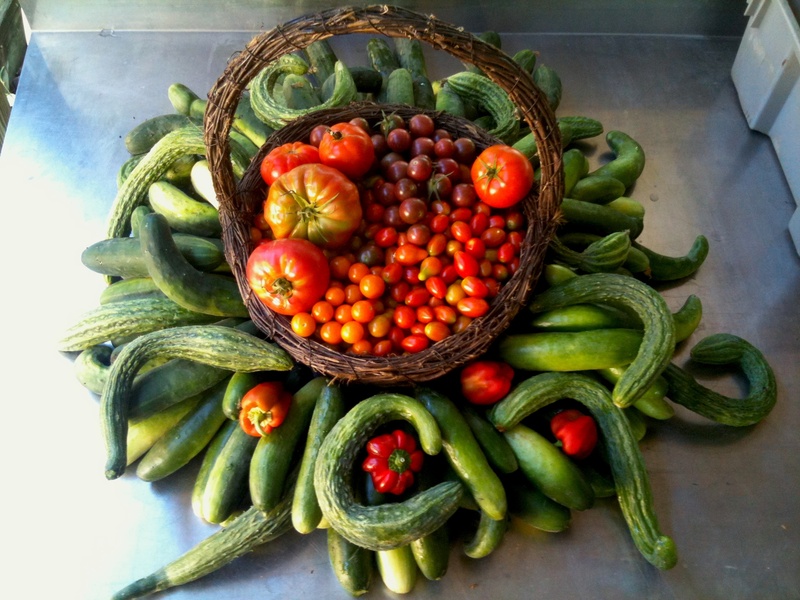 ARTfarm is a small and diverse farm with a focus on variety and high quality. Our specialty is prewashed ready-to-eat salad greens in spicy, sweet, baby, micro, and arugula mixes. Every year we experiment with new varieties of heirloom tomatoes and cherry tomatoes. We grow at least three kinds of cucumbers every season. We grow many kinds of bunched greens for cooking or juicing. Sometimes, we play with our food. Green green cukes, red and orange tomatoes and peppers. Eat them, eat them! Here they are! We also feature a variety of popular vegetables including beets, carrots, pumpkin, long beans, eggplant, okra, onions, hot and sweet peppers and more. We grow many types of fresh herbs including flat leaf and curly parsley, flat leaf and curly cilantro, recao, garlic chives, scallions, lemongrass, three kinds of basil, thyme, tarragon, lavender, dill, sage and more. Edible and decorative flowers include zinnias, cosmos, pansies, nasturtiums, sunflowers and orchids. Fruits available in season include pineapples, mangoes, limes, soursop, mediterranean figs, avocados, bananas, chocolate pudding fruit, sugar apple, mamee apple, mespol, golden apple and more. Value added products that we sell at the farmstand include local honey, fresh baked breads, garden fresh flower bouquets and locally made dairy-free coconut-based ice cream. We don’t suggest eating them, but we have grown native trees and plants from seed under contract for medium-scale reforestation projects (300-800 saplings) for local and federal entities. We usually have surplus inventory of native tree species for sale, please ask. Species have included black olive, pouhy, sandbox, lignum vitae, pasture fiddlewood, orange manjack, mangrove, dog almond, brisselette, pigeonberry, black mampoo, blackrodwood, water mampoo, linguam, century plant, jamaican caper, ironwood, sea grape, turpentine and others. I’m here until Friday, Sep 9th.. Will the farmer’s market be open on Wednesday from 3p-6p, as indicated? Sorry Bridgette we are currently in our summer break mode. We generally close from the end of August until the end of October for the hottest, hurricane, low season months on St. Croix. We are still here working but we are not open and we don’t have anything for sale. It’s a bit like the dead of winter in the states. Otherwise most of the big farm markets on St. Croix happen early Saturday morning so so you are unfortunately going to miss them this week. Sorry to have missed you this time and safe travels!